The brave techies at Blogger have been poking screwdrivers into the servers - all with the aim of making the service better. Even Google's official blogs displayed Blogger's maintenance message. 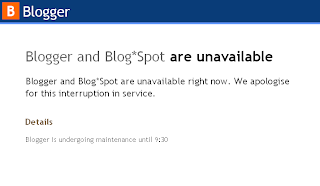 At the time of this posting the "old" version of blogger (which seems to include Blogger's own Buzz Blog) is still down.